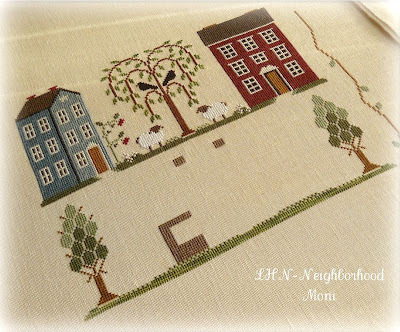 My LHN Neighborhood is going ahead, stitch by stitch... It is such an enjoyable design! I cannot wait to see it and yours finished. 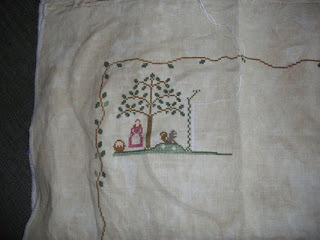 I changed the colour of the fence in the lower section, as "white" did not stand out enough against my coffee dyed linen. After a few "tests" with other colours, I decided on DMC 612. It has been a while since I posted. 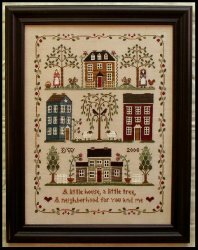 I have been working away on this sampler, but as I have other projects that I am also working on, I am afraid I have only got this far. Not too sure about the squirrel. The colours seem a little off to me. 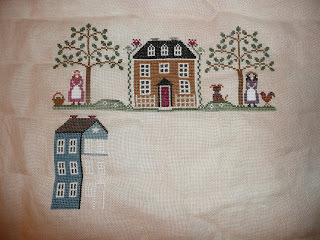 I will see what I think when I have finished the entire sampler. 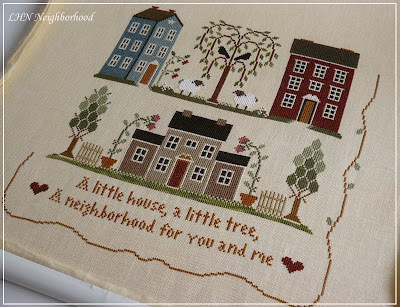 Currently I am working on Neighborhood as part of the Let's Stitch blog Friday night SAT. Anyway, I am happy to share my little progress with you now! House of Embroidery hand-dyed thread col. "Bush" instead of DMC 937. Never used this brand of threads previously. My eyes were caught by them at my LNS and I picked up a couple of "greens" that seemed good for my Neighborhood, just to try. They are very soft and pleasant to stitch. I am enchanted by all your progress and variations. Thanks for sharing! I love this SAL, it is so relaxing, without rigid deadlines... It suits me...! Hello! I have not posted in a long time mostly because I wanted to be further along when I did...but I decided this morning it was time to post what I have done thus far. I am still loving this project it's just that (as with many of us) I am working on more than one piece at a time. 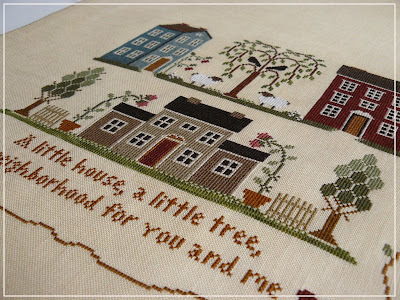 I'm finding this is a great project to bring with me places to stitch on. Once I get an outline of a house done it's very easy to fill it in while I'm chatting with the other mom's at my daughter's ballet class! 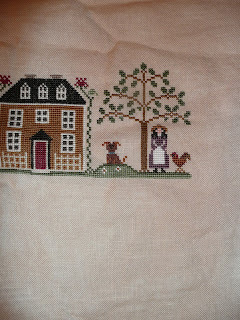 (Maybe I've been chatting too much though ;-) The only change I've made so far is that I am stitching two dogs (from CCN's You Are My Sunshine) rather than the squirrels. I just love the dogs from that pattern and since we have two dogs I thought they would be great for this. The first dog fits perfectly so now I just need to figure out the mirror image for the other side. That's it for me... I love reading everyones updates and seeing everyones beautiful work. Thanks for sharing!